With the beginning of their summer holidays, not only the students in Bavaria today have reasons to celebrate, but also our customers have a reason for celebration. Since today you get 1 month for free when ordering a Contabo Dedicated Server Core i7 and you don't have to pay any setup fees. Moreover, our customers receive a high-quality hardware RAID controller from 3Ware free of charge. 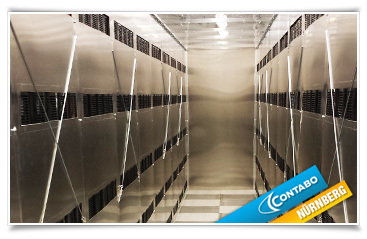 Order now a Dedicated Server Core i7 because the offer is only valid for a short time. 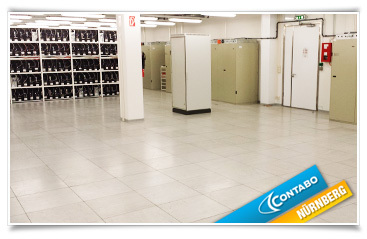 Exclusive Insight: Contabo data center in Nuremberg! 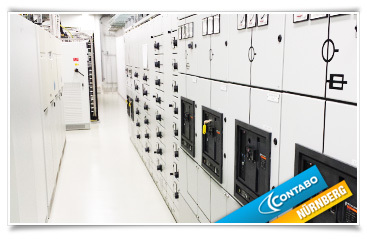 In addition to various other (large) projects, whose positive results will soon be visible on our website, the commissioning and further maintenance of our second data center in Nuremberg was of course one of our major tasks in 2014. 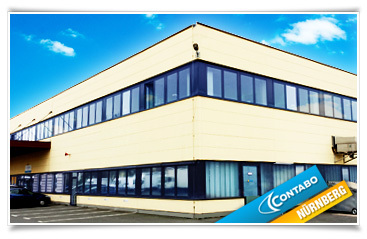 Our second data center location does not only provide the necessary space for further development, but also offers our customers many new opportunities for their server operation, for example corncerning colocation services: by means of targeted site selection (Munich/ Nuremberg), our customers can now decide for themselves where their own servers and technical equipment are located in future. This innovation and many other improvements will be found shortly on Contabo.com. Stay tuned for further information and look forward for attractive offers soon on our website. New server model? Your opinion matters! 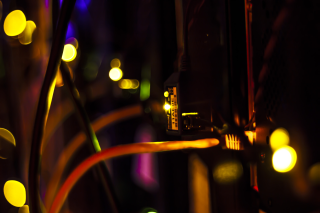 Recently, there have been some new hardware releases which also could be very interesting for possible new dedicated server offers. Once again, we would like to ask for your feedback on the following alternatives. Given the choice between the following options, which server would you buy? We would be thrilled to hear why you would prefer one of them over the other. Or is there an entirely different configuration which you would be interested in? Feel free to post in the comments for this. Looking forward to hearing from you :-)! An era is just about to draw to a close. The GIGA Dedicated Server XL, which has been a successfull contributor to our server fleet for years, will vanish from our portfolio shortly. This XL rootserver will only remain available for ordering from our homepage for a short while. You have got just a few more days left to grab a hold of this server at a monthly rate of 44.99 EUR. Giga-International will not offer any root server afterwards at such a low monthly rental fee. For many many years, actually for almost a decade, the Dedicated Server XL played a vital role in Giga International's story of success. Almost nearly 7 years ago, back in January 2005, it entered it's high end position within our server portfolio, being the most powerful server then. And considering the time span of 7 years - in terms of hardware developements an incredible long time - it was never eliminated from our portfolio. Given the technical circumstances back then, this server was equipped with sensational 2GB RAM, an Intel Pentium IV 3,0 Ghz processor and hyperthreading technology, as well as a 250GB harddisk. It's hardware never changed and the server operates frontline, until nowadays. Like a true gentleman, it never changed it's style and elegance. The dedicated server XL was built and configured by Giga International for their customers ever since in a number of several hundred machines.During the following years we introduced the DUAL-Core and even QUAD-Core servers with a multitude of RAM and harddisk capacity. But, it took well over 4 years, until in Spring 2009 a new dedicated server model, the Core i7, ruled out the model XL for being the most popular server ever rented (Nonetheless, this record could not be kept for such a long time, since it was broken by it's successor, the even more popular Dedicated Server 6-Core). What makes this dedicated root server, which requires - unlike to the virtual servers - to be individually built for each customer and connected in our datacenter, so special and so unique that it was kept on the hosters product portfolio for 7 years, and is still remains to be contineously requested and ordered on a daily basis by our clients? One of the reasons might be it's Intel Processor with hyperthreading, which features a technology that was ground breaking back then, but which also still satisfies the demands of most applications using it for a 'Dual Core' substitute. Or maybe it is the fact, that it's random access memory with 2GB still suffices for each LINUX distribution and even supports the latest resource consuming WINDOWS operating systems. 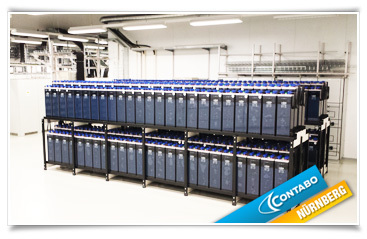 Or pretty simple, it might be the incredible low price, due to the depreciation of hardware costs, of 44.99 EUR per month for a self operated server, including electric power, air condition and unlimited traffic which makes it so attractive. However, maybe it is the charm of this little root server legend, which was placed into service shortly after the foundation of Giga International and which has ever since supported the raise and expansion of Giga International. Likewise any customer who enjoyed ordering and using one of these appliances until today. Retain one of these budget servers and experience yourself the incredible performance our 'oldie' is still able to proof. Reserve this little symbol of 'nostalgia' during the last remaining days of it's tenure, because once vanished from our portfolio, it will not ever return. And just like the old saying goes: Legends may sleep - but they never die. Price reducation for our rootservers! Today we're cutting the monthly fees for our popular rootservers once again. This time, we're lowering the prices of our two most powerful servers which is the Dedicated Server Corei7 and the Dedicated Server 6-Core. Now only 99 EUR / month! Only in August: No setup fee! Now only 119 EUR / month! 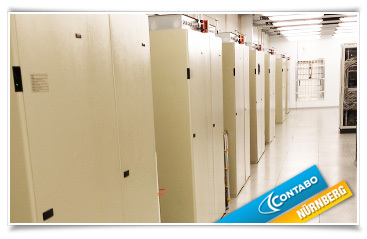 Compare our server models and order now! Ab dem heutigen Tag senken wir einmal mehr die Monatsgebühr für unsere Rootserver. Betroffen sind unsere beiden besten Pferde im Stall, der Dedicated Server Corei7 und der Dedicated Server 6-Core. Jetzt nur noch 99 EUR / Monat! Jetzt nur noch 119 EUR / Monat! Jetzt Server vergleichen und bestellen! 100 Mbit/s is not enough: 1 Gbit/s Uplink for your server available! When it comes to supporting specifically intensive traffic applications and assisting its customers with low, even marketing-wise unusual cheap prices, in order to make their ideas and projects come true, Giga-International is looking back at a long successful history. With pride we may remind that many years ago, Giga-International was among one of the first hosting providers on the market who introduced a traffic flatrate for all of their servers. That was way back when most of the major providers still had set a traffic limit of 300, sometimes 500 GB per month. In the light of this great tradition, it seems only logical for us to take the next step and launch a bandwidth package for our clients, with which we once more backup our status as pioneers in regards to internet bandwidth provision. This offer is simply second to none on the hosting market nowadays. NEW: Upgrade "1 Gbit/s Port"
With this upgrade your server is going to be equipped with a 1 Gbit/s uplink (= 1000 Mbit/s) instead of the default 100 Mbit/s port. Set new standards in respect to the speed of data transfer of your server and decide for the 1 Gbit/s port. And as a matter of fact of course, there is no traffic limitation. Your server is set to 'unlimited traffic'. The monthly surcharge for this 10 times faster connection is only 99.00 EUR. This upgrade is available for all our root servers as of today and can be added by a simple click during the ordering process. From now on, we have cut our price by half for our upgrade "100 Mbit/s bandwidth guaranteed" which could be added to any selectable dedicated server. This exclusive bandwidth model did cost 199.00 EUR per month formerly, and is now available at a sensational price of only 99.00 EUR per month. Practically this means that you can use the full 100 Mbit/s, simultaneously up- and downstream doubled, day and night, hour by hour and daily as you like. There are no limitations at our end. You will neither be shaped, nor throttled in any way. Your server is still connected to 100 Mbit/s? Give it a try and boost it up to 1 Gbit/s. Hop on to a new highspeed server generation - click here! Giga-Hosting hat es sich seit jeher auf die Fahne geschrieben, gerade sehr trafficintensive Anwendungen besonders zu unterstützen und seine Kunden mit günstigen, oft gar marktunüblich niedrigen Traffic-Preisen zu helfen, die eigenen Ideen und Projekte zu verwirklichen. Nicht ohne Stolz dürfen wir daran erinnern, dass Giga-Hosting zu den ersten Hosting-Providern am deutschen Markt überhaupt zählte, der für all seine Server vor vielen, vielen Jahren die Traffic-Flatrate einführte. Und das in Zeiten, in denen ein Trafficlimit von 300, vielleicht 500 GB pro Monat bei den meisten großen Anbietern noch auf der Tagesordnung stand. Angesichts dieser großen Tradition ist es dann für uns auch nur logisch, heute den nächsten Schritt zu gehen und für unsere Kunden einmal mehr ein Bandbreiten-Paket zu schnürren, mit dem wir unseren Status Quo als Pionier in Sachen Internetbandbreite untermauern. Denn Sie werden auf dem Hosting-Markt aktuell schlicht nichts vergleichbares finden. NEU: Upgrade "1 Gbit/s Port"
Mit diesem Upgrade erhält Ihr Server an Stelle des serienmäßigen 100 Mbit/s-Ports einen 1 Gbit/s-Uplink (=1000 Mbit/s). Setzen Sie neue Maßstäbe, was die Datentransfergeschwindigkeit Ihres Servers angeht und entscheiden Sie sich für den 1 Gbit/s-Port! Selbstverständlich gibt es auch bei dieser Anschlussmöglichkeit keine Trafficlimitierung, Ihr Server verfügt über unlimited Traffic! Der monatliche Aufpreis für die 10-fache Geschwindigkeit beträgt gerade einmal 99 EUR / Monat. Das Upgrade ist für all unsere Rootserver ab heute verfügbar und kann während des Bestellvorgangs hinzu geklickt werden. Für unser Upgrade "100 Mbit/s Bandbreite - 24/7 garantiert", welches bei der Bestellung eines beliebigen dedizierten Servers auswählbar ist, haben wir ab sofort den Monatspreis halbiert. War eine solch exklusive Bandbreitengarantie bislang nur für 199 EUR pro Monat zu haben, so erhalten unsere Kunden diese Leistung ab jetzt für sensationelle 99 EUR pro Monat. Das bedeutet für Sie in der Praxis ganz konkret: Nutzen Sie die vollen 100 Mbit/s - gern auch parallel im Up- und Downstream gleich doppelt - unseretwegen Tag und Nacht, Stunde um Stunde, Tag um Tag; von uns werden Sie weder gedrosselt noch sonst eingeschränkt. Wir wollen, dass Sie unsere Leitungen glühen lassen! Bei einem Durchschnittsverbrauch über 20 Mbit/s in einem zusammenhängenden Zeitraum von mindestens 10 Tagen - die Zeit von 2:00 Uhr nachts bis 11:00 Uhr vormittags jeweils ausgenommen - erfolgt eine Umstellung der Anbindung auf 10 Mbit/s. Bei einem Durchschnittsverbrauch über 40 Mbit/s in einem zusammenhängenden Zeitraum von mindestens 10 Tagen - die Zeit von 2:00 Uhr nachts bis 11:00 Uhr vormittags jeweils ausgenommen - erfolgt eine Umstellung der Anbindung auf 10 Mbit/s. Ihr Server läuft noch mit 100Mbit/s? Versuchen Sie es mal mit 1 Gbit/s. Steigen Sie jetzt mit uns ein in eine neue Highspeed-Servergeneration! 100 % Freecooling in June! It's summer in Munich. Although today it's a rather rainy day and the temperature isn't higher than 15 degrees during the day, it's still June and it's still one of the warmest months in the year. With respect to the facts mentioned above it seems even more remarkable to me that both of our fully redundant air conditioning systems located on the roof of our datacenter are working in the freecooling mode (100% freecooling) right now. This freecooling mode means that there's not running a single compressor in the cooling chillers to cool down around 1500 servers in our datacenter today. 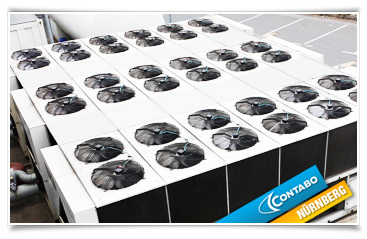 The whole cooling process is done by using the cooler air from outside to cool down the water of our refrigerant curcuit. There are some pumps and ventilators left which are responsible for transporting the water and air from outside into our datacenter. But nothing else, no more power consumption. 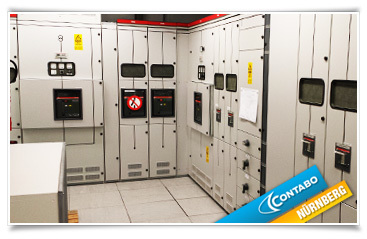 As there's not running any compressor in our chillers at all, we're saving lots of energy. There's no doubt that we usualy save this energy during the winter and during the colder months in autumn and spring, too. 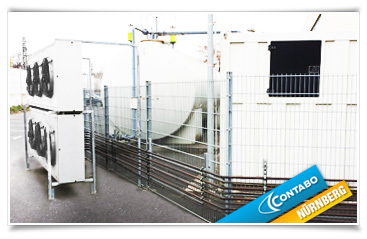 However, our modern and high-quality cooling units are good enough to save this energy even during the summer - just like they are doing right now. And these savings are pure money what we redirect to our customers by making great prices and providing excellent services with highly-educated personal on site. It's a typical "win-win-situation". But in this case, we have 3 winners: The customers, the datacenter and our environment. 6-Core Server with 24 GB RAM now only 149 EUR / month! 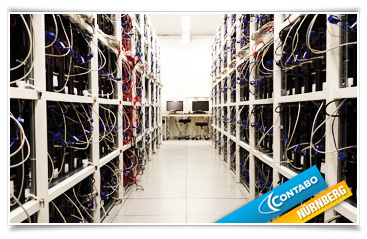 We have cut the monthly fee for our best server "Dedicated Server 6-Core" from 199 € / month to only 149 € / month. Our flagship server comes with a Intel 6-Core processor, with 24 GB RAM, with a 80 GB Intel SSD and an additional 2 TB HDD. 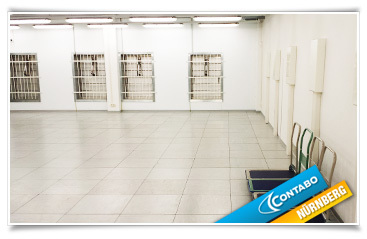 Furthermore, we have removed the setup fee for installing a Software-RAID 1. Thus, you're able to order your server with harddisk mirroring done by a Software-RAID without paying additional fees for it from now on. 100 Mbit/s 24/7 – now only 199 EUR! For many of our server customers it's very important to get an internet bandwidth for their server which is guaranteed 24/7 during day and night and, moreover, which is allowed to be used by their server without running the risk of being suspended or throttled. So what we did with immediate effect is that we halved the monthly price for our server upgrade "100 Mbit/s dedicated bandwidth - 24/7 guaranteed" which is available for every dedicated server during the order process. Up to now such an exclusive bandwidth guarantee only has been available for 399 EUR per month. Now our customers get this benefit for amazing 199 EUR per month! 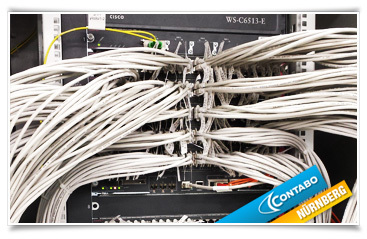 Of course, we also cut the prices for our dedicated bandwidth usable with our housing solutions accordingly. With this enormous price reduction we would like to invite our customers to something most other providers are afraid of: Please don't hesitate to use our quality upstreams and do use as much traffic as you want! It is our goal to support your growth, and not to put a stoke in your wheel.